"This simple marinade for shrimp is guaranteed to please. Passed down by my mother-in-law, it's without a doubt one of her greatest contributions to humankind. Serve over rice." Whisk together the canola oil, hot pepper sauce, garlic, chili sauce, lemon juice, and oregano in a large glass or ceramic bowl. Add the shrimp and toss to evenly coat. Cover the bowl with plastic wrap, and marinate in the refrigerator 1 hour. Remove the shrimp from the marinade, and shake off excess. Discard the remaining marinade. 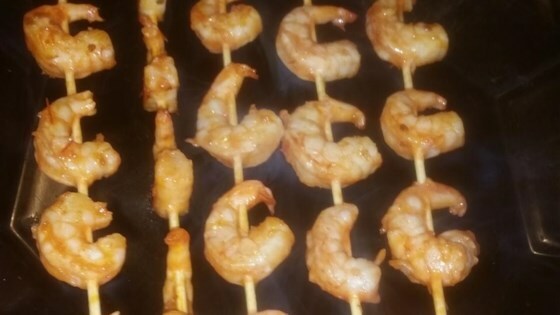 Thread about 4 shrimp onto each skewer. Cook on the preheated grill until pink on the outside and no longer translucent in the center, about 3 minutes per side. We have determined the nutritional value of the marinade based on a retention value of 10% after cooking. The exact amount will vary depending on ingredient density, and the specific type of oil and other ingredients used. This is outstanding. Also consider increasing the chili sauce and decreasing the oil for a little more bite. His mother-in-law is my mother so I agree about the recipe. I only leave the tails on if I'm serving these as an appetizer. They're delicious cold too. Yum! My kids and I loved this recipe. I changed it a bit. I used regular chili sauce, marinated about 1 hour then cook in a pan on the stove. These were excellent shrimp. My wife, who doesn't really like shrimp ate all of hers! !